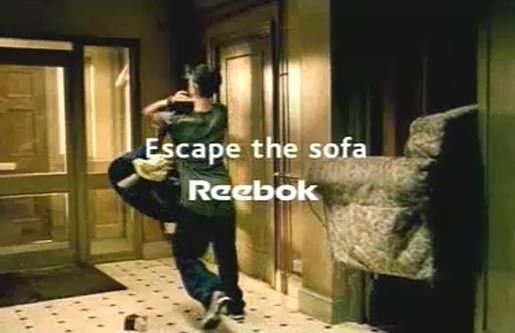 Reebok in 2001 promoted the active lifestyle with ‘Sofa’, a humorous horror TV advertisement in which a young man (Ashley Artus) is forced to get on his feet when his sofa turns feral. Keep an eye out for small details, like the money falling out of the couch as it swings around the room. The Reebok Sofa ad was developed at Lowe, London, by creative director Paul Weinberger, copywriter Tony Barry, art director Vince Squibb, and agency producer Charles Crisp. Filming at Black Island studios, Acton, was directed by Frank Budgen via Gorgeous Enterprises, London, with producer Paul Rothwell and director of photography Alwin Kuchler. Editor was Russell Icke at The Whitehouse Post, London. Music was provided by Toby Anderson at Lo Town, London. Visual effects were developed at Asylum SFX, London, under the management of Mark Ward. Patrick Comerford, one of the puppeteers, told Creative Review in 2002 that he and his colleague had to wear blue suits while shooting so they could be painted and edited out in post production. They manipulated Asylum’s specially built “nice and light” sofa specifically so they could manipulate it from behind like a big glove puppet. For the walking shots they grabbed the underneath from the side and moved it accordingly. For the chasing around the room bit, Asylum set up a rig (to support the main weight and structure of the sofa) so that they could make it move around the room quickly and still animate the “body” of the sofa. The second sofa, used in the stairwell shot, was made of polystyrene and supported on a network of cables calculated to stop the sofa at set positions. Reebok Sofa won the 2002 BTAA craft award for best live action special effects, the Epica 2001 Clothing & Fabrics award, silver for direction in the 2002 D&AD Awards, a Gold Lion for Clothing & Footwear at Cannes Lions International Advertising Festival, 2002, awards in the British Television Craft Awards, 2002 for best editing, live action special effects and production design, a silver for editing at the 2003 CLIO Awards, the Grand Prix for TV and gold for cinema and retail services at the 2002 Kinsale Sharks Awards Advertising Festival, and gold in the AME Awards (Advertising Marketing Effectiveness ) – New York Festivals, 2002.